First off, I feel like I should explain myself. You see, most of what you hear on the news and read in newspapers about Global Warming is wrong. And when I say "wrong", I mean an outright fabrication of facts. Unfortunately, whenever I try to tell people about this, the general reaction goes something like this: "What?! You don't believe in Global Warming?! You're worse than Hitler!!". Alright, so maybe that's slightly hyperbolic, but only slightly. So, in the interest of setting the facts straight, I present 4 popular misconceptions about Global Warming and the actual realities. No, they aren't. Polar bear populations have increased by almost 50% in less than a decade, from 1480 animals in 1992 to 2272 animals in 2001 (http://alaska.fws.gov/fisheries/mmm/stock/finalpbbeaufortsea.pdf). That data comes from the U.S. Fish and Wildlife Services. Prior to that, polar bear populations had indeed been decreasing, largely due to over-hunting, but after polar bear hunting was curtailed, the bears made an amazing comeback. So, the next time someone says they're worried about polar bears, tell them that the bears are fine and that they should worry about all the animals that are really becoming extinct. Melting polar ice caps are going to flood coastal cities. 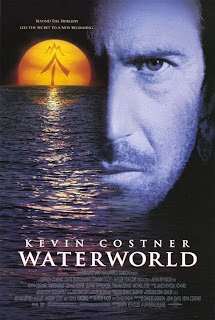 It may surprise you to learn that the movie Waterworld did not, in fact, have a sound scientific basis. Between 1986 and 2000, Antarctic valleys cooled 0.7 degrees celcius per decade, with serious ecosystem damage (including cute little penguins) resulting from the cold (http://www.nature.com/nature/journal/v415/n6871/full/nature710.html). In fact, Antarctic ice is increasing at 26.8 gigatons per year, reversing the melting trend that has been in place for the last 6000 years (http://www.sciencemag.org/cgi/content/full/sci;295/5554/476?maxtoshow=&HITS=10&hits=10&RESULTFORMAT=&fulltext=positive+mass+balance+of+the+the+ross+ice+streams%2C+west+antarctica&searchid=1&FIRSTINDEX=0&resourcetype=HWCIT). In case you didn't know, a gigaton is one billion tons. And the fact that Antarctica had been melting for the past 6000 years seems to suggest that people may not be the only influence on climate. Global Warming is causing more hurricanes, like Katrina. Total hurricane strikes in the U.S. are at an all-time low. There were more hurricanes in the 1850's than the 1990's, and during years in between, the hurricanes go up and down, but generally down (http://www.nhc.noaa.gov/pastdec.shtml). Obviously, hurricane Katrina has colored all our opinions, but the fact is: you have less chance of being hit by a hurricane than people did 150 years ago. "Hurricanes don't care about Global Warming"
This graph shows nothing. I'm sure you've seen it before, or others like it. Have you ever actually taken a good look at it? It looks like it shows the planet in the midst of exploding, but it actually shows an average temperature increase of 0.8 degrees C. As you read above, Antarctica has cooled by nearly that amount every decade for the past 25 years. That you can't believe everything you hear about Global Warming. There are many more holes in the theory, from the drops in global temperature between 1940 and 1970, the reliability of the data, the urban heat island effect, and countless more. I urge you to go out and research these things, and verify what I've posted, because peer review and proper interpretation of data is essential for science to be taken seriously. At the end of the day, Global Warming might be a political issue, or a social issue, or an economic issue, but without proper consideration as a scientific issue, it means nothing. i really impress with you blog and plz keep writing for this blog. 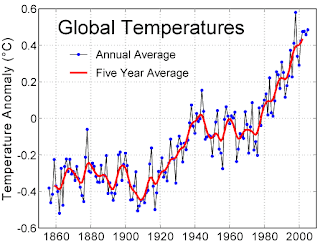 i also start collection of information about causes of global warming in my blog.